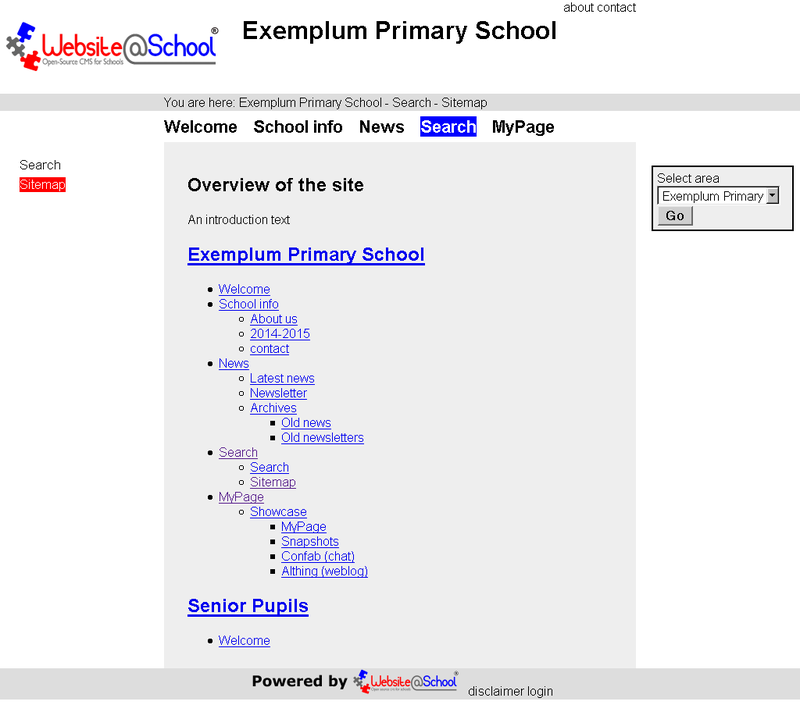 The Sitemap is a module to display different kinds of sitemaps on a page. 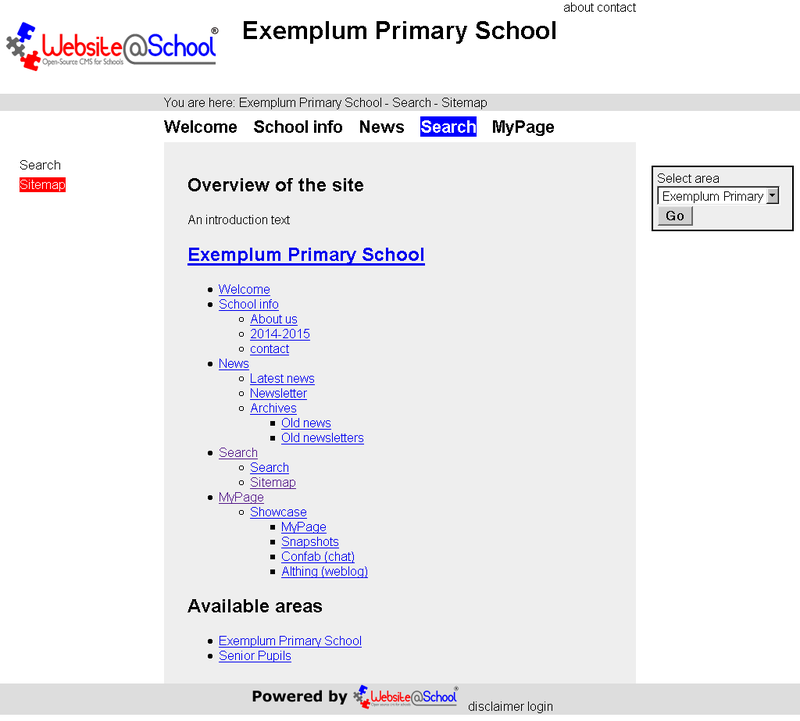 Limited: A page with a complete sitemap of the Area and the title names of the other areas. Full: a page with all Areas with their sections and pages. Links: All area-, section- and pages names are clickable links to those items. Intranet: A sitemap on an Intranet only shows the areas, sections and pages the logged in user has acces to. 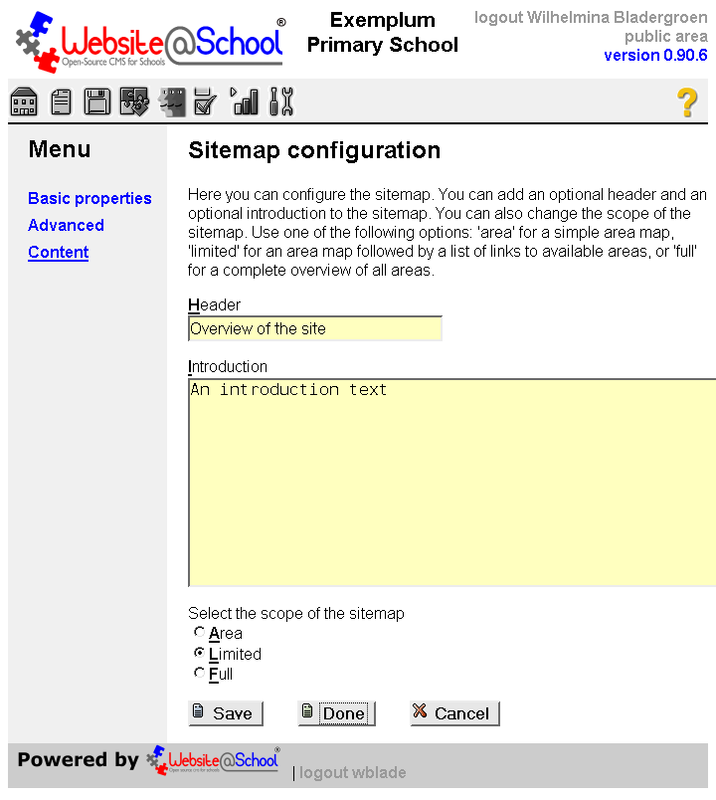 In this section we describe the three variants of the Sitemap module: Area, Limited and Full. The Area title, i.e. 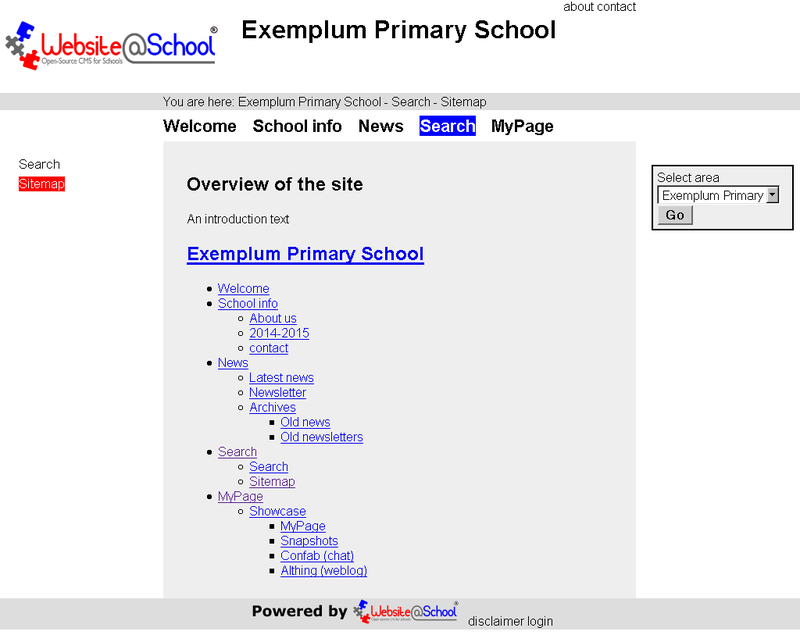 in the demonstration data 'Exemplum Primary School'. All sectionsm sub-sections and pages. Limited: Shows the sitemap of the Area where the sitemap is located and an overvieuw of the other public Areas on the site. Tow ara titles: 'Exemplum Primary School' and 'Senior Pupils'. Full: Shows all sitemaps of all Areas. All sections sub-sections and pages, in this case only 'Welcome'. Fill out the fields as described in section 3.1 Add a page in chapter Page Manager. In the Module dropdown menu, select the module. Do not forget to select Visible, Hidden or Embargo. Click [Save] to save your work and return to the Edit basic properties of page nn dialogue. Now click on Content to enter the module configuration dialogue. Here you can configure the sitemap. 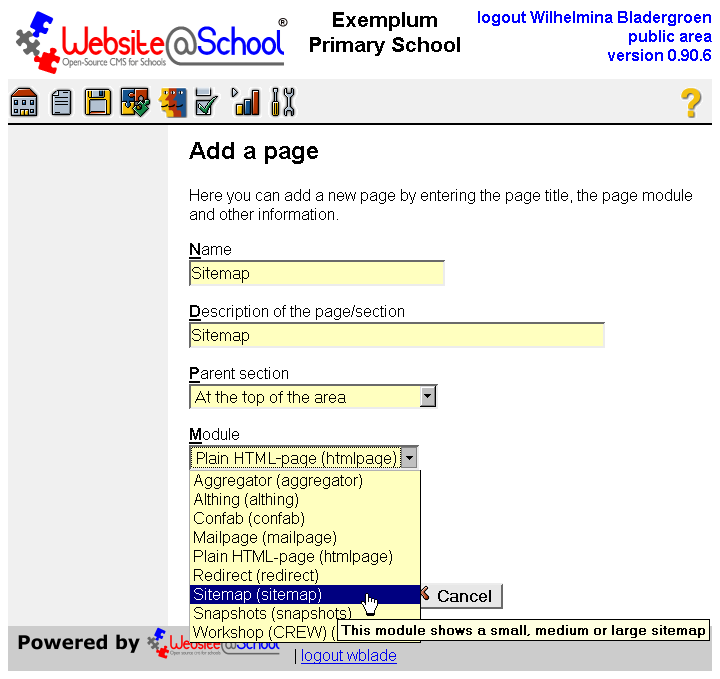 You can add an optional header and an optional introduction to the sitemap. You can also change the scope of the sitemap. Use one of the following options: 'area' for a simple area map, 'limited' for an area map followed by a list of links to available areas, or 'full' for a complete overview of all areas. Header: Header text maximum length is 240 characters. The text is used for the subject. Default text: Overview of hte sie. Set the scope of the sitemap: Select one of the three radio buttons below. Limited: A page with a complete sitemap of the Area and the namse of the other areas. Full: a page with all Areas and their sections and pages. Cancel: To cancel your action and return to the Page . After clicking [Done], you can admire the Sitemap.